Flat tire? No worries! 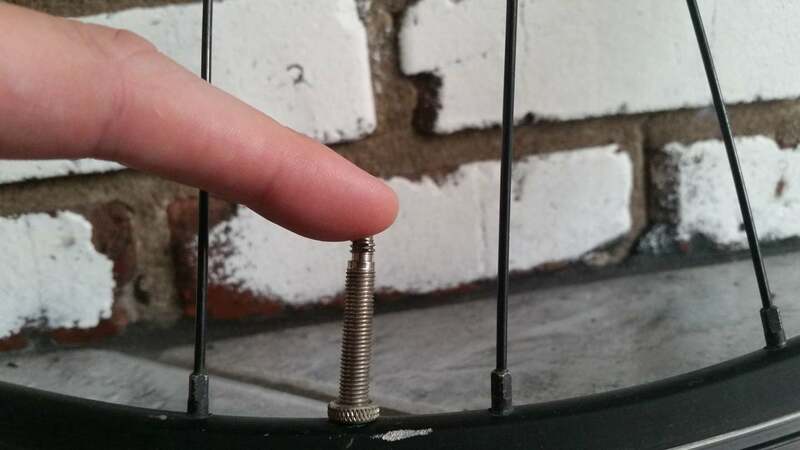 Learn how to replace the tube inside your bicycle tire. Wherever you choose to ride your bike, a flat tire is never out of the question. With a few basic tools and a little bit of know-how, you'll be able to fix this common problem and be back to riding in no time. If you want to save a few bucks by reusing your old tube, check out my guide on bicycle tube patching. Patching is a more time-consuming process and is not always permanent, so replacing your tube outright is often preferred. Position a lightly inflated tube inside the checked tire. 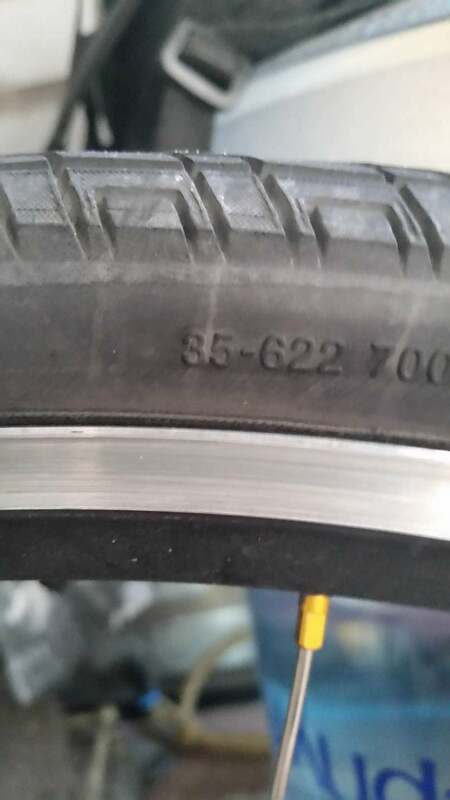 Every bicycle tire has a 5 digit number printed/embossed along its sidewall. This number, called the ISO number, is essential to purchasing the correct size of tube. 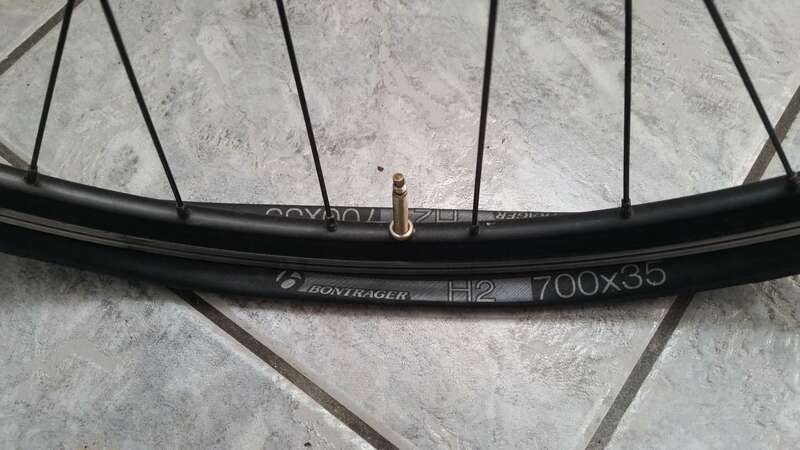 While the cycling industry has adopted certain nomenclature for sizing of tire (29er, 700C, 650B), the ISO number is the sure-fire way to get the correct size every time. Make sure to match the valve type as well: Presta and Schrader Valves are typically not interchangeable. 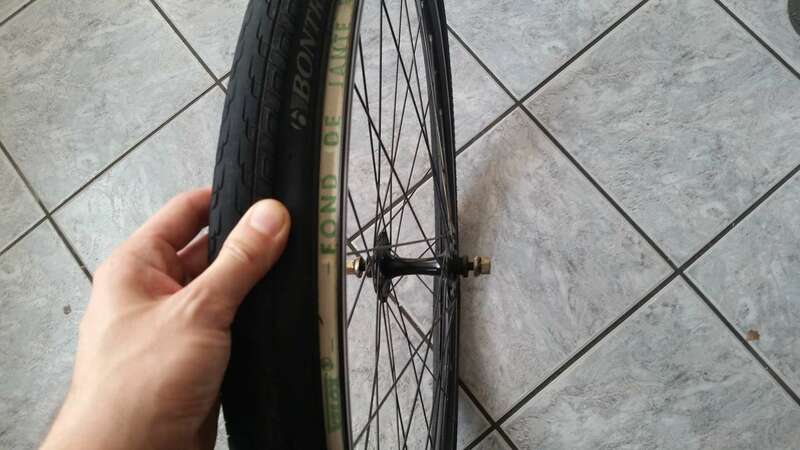 Your bicycle may have two different sized tires, so be aware! Remove the wheel from the frame. 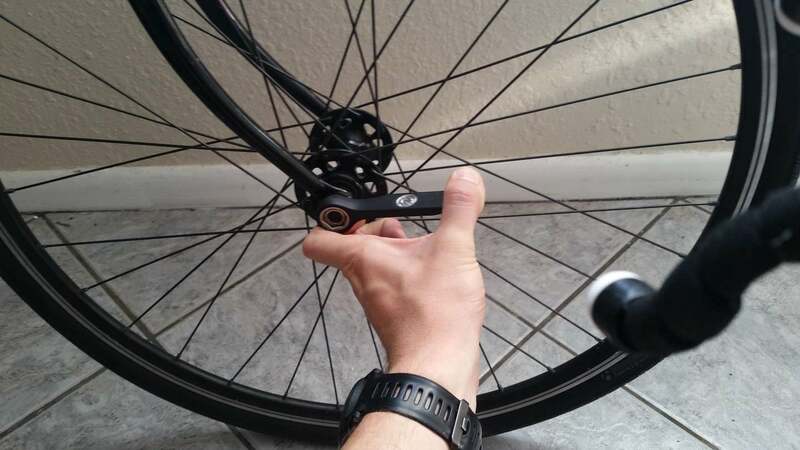 You may need to disengage your brakes to allow the wheel to slide out of the frame's dropouts (wheel holders). Quick Release Lever - Release the quick release lever by pulling the tab of the lever towards you. Once the lever is the open position, hold the opposite side and loosen the skewer by turning the lever anti-clockwise. Be careful not to lose the two springs on the skewer! They are important. Bolt on Axle - Again turning anti-clockwise, use an appropriate sized wrench (usually 14 or 15mm, adjustable will do in a pinch) to loosen the axle nuts of the wheel. Thru-Axle - Consult the manufacturer for best practices. Can commonly be turned anti clockwise to loosen. You will need to remove entire internal thru-axle for wheel release. If this is the rear wheel, be sure to shift to the smallest cog. It will make dealing with the chain easier. 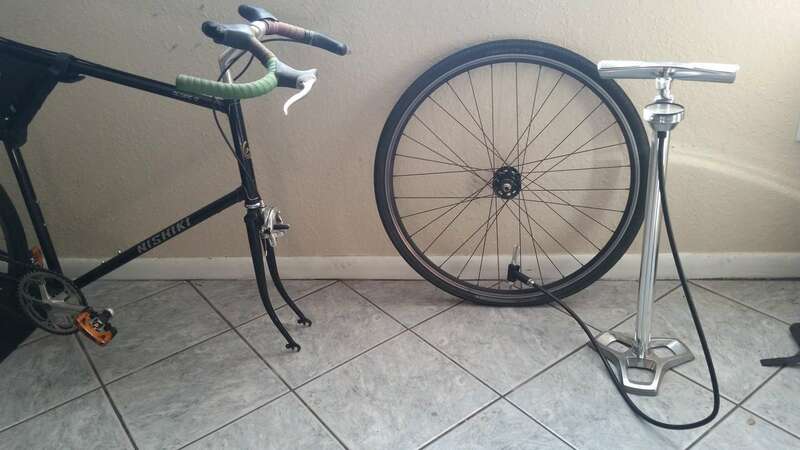 It is helpful, though not necessary, to have a bicycle repair stand to aid the process. Improvisations include: flipping the bike upside down, using rope to tie to a hanging branch, or having your buddy hold it up for you. Presta: After remving plastic top cap, turn threaded barrel end anti-clockwise. Depress pin to allow pressured air to escape from the valve. Schrader: Remove plastic top cap. Using a small rigid tool, depress the internal pin of the valve to allow pressured air to escape. If tube has lost all pressure, this may have no effect. This step is really to ensure that removing the tire from the rim is easier. Grab your tire levers. Those little plastic spoon things, yes. Beginning at the farthest spot from the valve, use the first lever to get underneath the bead of the tire. After getting all the way underneath, use the spoke holder notches of the lever to brace it against an inline spoke. Use the second lever to "scoop" underneath the first, and rotate it under the entire the outer bead to separate it from the rim. This should be a relatively smooth process. Repeat for the other bead. The bead of a tire can be steel, nylon or kevlar. Each has its own merits, but the same purpose: to seat the tire evenly on the rim. 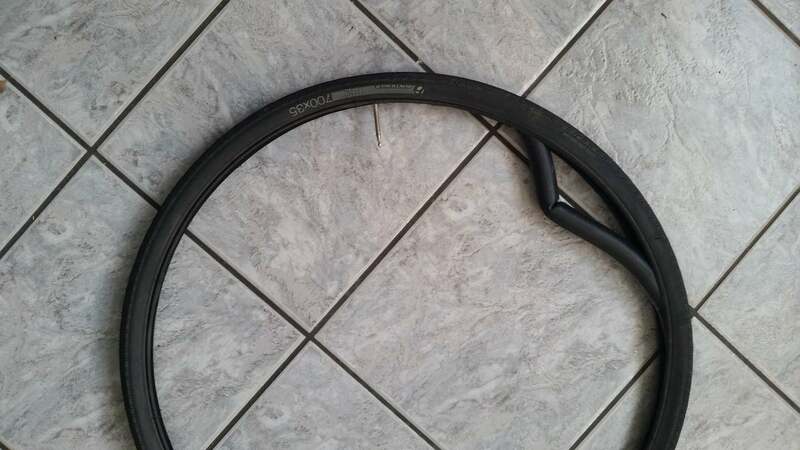 With the tire completed removed from the rim, remove the inner tube. Using a bicycle pump, lightly pump the defeated tube until it has shape. As you pump: look, feel, and listen to determine where the tube is failing. Often times, it can be difficult to find the hole in a defeated tube. 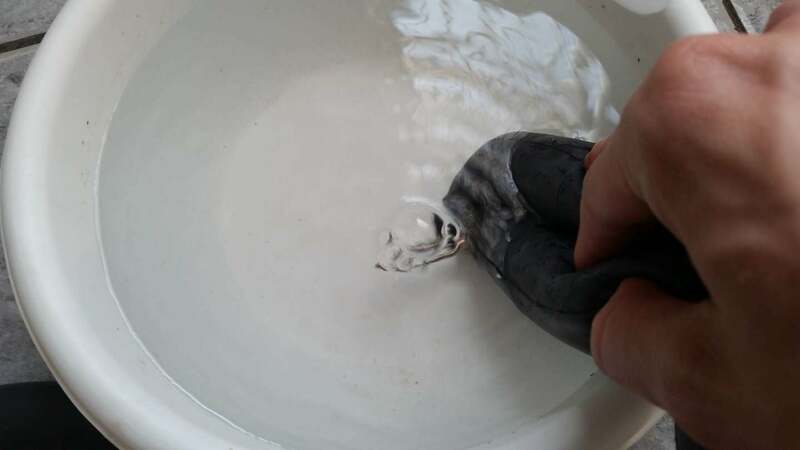 Inflate the tube, then submerge it in water to find the leak quickly. Once the leak has been found in the tube, try to match it to the tire. Examine the outside of the tire for seperation, cuts, glass, staples, or anything that looks irregular. Check the inside of the tire by LIGHTLY running your fingers along the inside. Take care, there could be sharp things stuck through the tread. For large cuts, where the tube is visible, replace the tire. You can use a dollar bill as a temporary boot, if necessary. 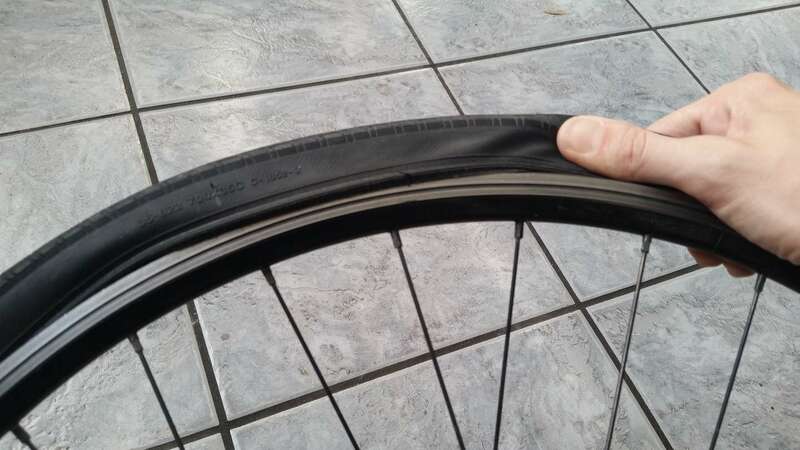 If the tube is showing a puncture on the inner (rim) side, you may need to replace your rim tape. After ensuring that no pointy things remain in the tire, remove the new tube from its packaging and inflate it just enough to give it shape. Remove the plastic top and threaded ring (presta only). Away from the wheel, allow the tube to sit inside both beads of the tire. Adjust the valve of the tire to be centered on a chosen logo for ease of reference. Reference the sidewall of the tire to ensure proper direction of rotation. Place the valve within the rim hole, and lightly thread on the threaded ring and plastic top. Centering the valve on a chosen logo isn't absolutely necessary, but will allow you match up holes in tires and tubes with ease. Ensure that the valve is seated straight through the hole of the rim. Using primarily your thumbs, roll the outer bead of the tire until it sits nicely on the rim. Take care not to twist or pinch the tube. With the far bead seated, continue to use your thumbs to roll the tire into position, Once pulled into the center of the rim, begin seating the bead of the tire at the valve, rolling away from the valve. The bead may be super tight, especially near the end of the process. Take care! This is where many people pinch or pop their tubes. Although the bead may seem super tight, it may be relaxed by rolling the bead away from the valve. Once complete, most tires will have a noticeable 'pop' or 'snap' once the bead has been seated. Ensure that both beads are properly seated before attempting to inflate. Unseated beads are common, and easily visible on a rotating tire. If you are having trouble seating, deflate the tube completely and use soapy water to lubricate the bead. Once both beads are seated, Remove the plastic cap, attach the pump to the valve and lightly pump the tire to 10 psi, checking as you go. As you pump, ensure that the tire looks equal on all sides, and that no bulges exist. Most tires also have a visible bead line indicator, which should be just above the rim on a properly seated tire. After pumping to 10 psi, if some bulges or irregularities show, deflate the tire and try again. If you are happy with the result, inflate to 20 psi and check again for bulges or irregularities. Now, pump it up to your preferred pressure. Close the valve and replace the plastic cap. Reference the tire's sidewall for recommended pressure ranges. Do the reverse of Step 2. Use the weight of the bike to help center the wheel in the dropouts. 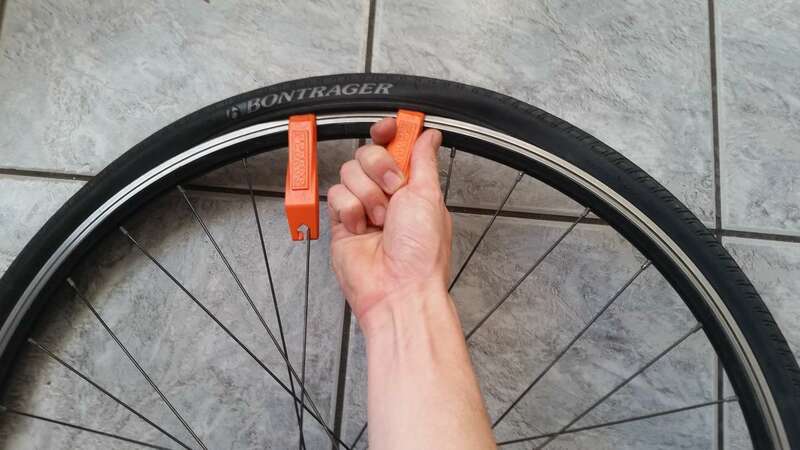 Make sure that your wheel mounting hardware is secure and safe to ride. Reconnect the brakes if necessary. 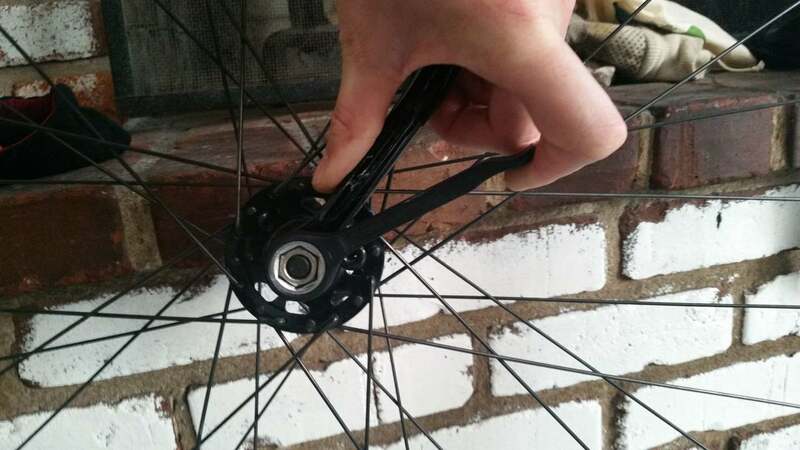 For rear wheels, ensure that the chain is on the rear cogs before slotting it into the dropout and wrenching it down. Refer to manufacturer's specification when determining the torque specification (tightness) of a bolt or nut. Roll the wheels through the frame. Make sure that the brakes operate the same, and nothing is rubbing or making unusual noises. If some issues come up, check the alignment of the wheel within the frame, and ensure that the wheels are tightly secured. If this seems out of reach, visit your local bike shop or Co-Op and ask them to show you what went wrong. I hope you enjoyed this guide, check out my profile for more! 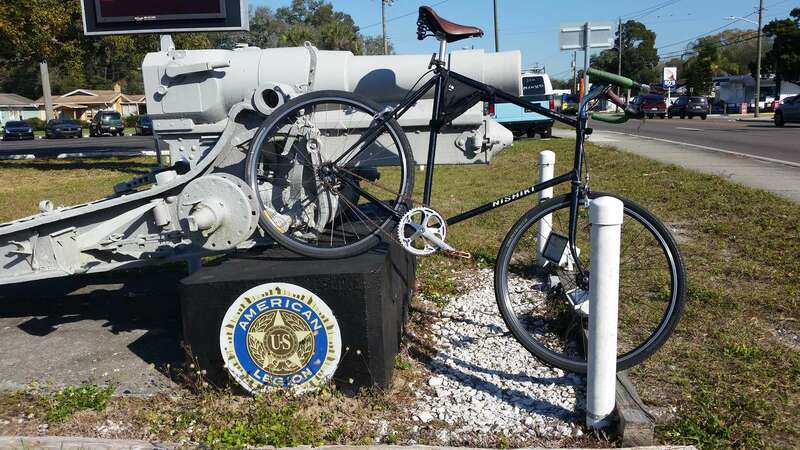 DO NOT RIDE A BICYCLE YOU FEEL TO BE UNSAFE. Andy is a tall, goofy bicycle mechanic with a fondness for bicycle touring, camping and survivalism. Patch a tube to salvage your ride home or to save a few bucks! Saddle nose too high? Too low? Learn how to set the right angle. Protect your investment. Lock it up.